The recent correction in the price of crude oil should have an immediate positive impact on the US consumer as well as on a number of business sectors. However there also may be a significant economic downside to this adjustment. Here are some facts to consider. The US consumer is not only about to benefit from materially lower gasoline prices (see chart), but also from cheaper heating oil. With wages suppressed, the savings could be quite impactful, particularly for families with incomes below $50K per year. Merrill Lynch: - ... consumers will likely respond quickly to the saving in energy costs. Many families live “hand to mouth”, spending whatever income is available. The Survey of Consumer Finances found that 47% of families had no savings in 2013, up from 44% in the more healthy 2004 economy. Over time, energy costs have become a much bigger part of budgets for low income families. In 2012, families with income below $50,000 spent an average of 21.4% of their income on energy. This is almost double the share in 2001, and it is almost triple the share for families with income above $50,000. Furthermore, with gasoline prices lower, it is unlikely that consumers will be buying significantly more of it than they have been. Historically when oil prices fell, gasoline consumption in dollar terms also fell. Dollars saved on fuel will be redirected elsewhere in the economy. Moreover, suppressed oil prices will, at least in the near-term, keep inflation expectations lower. That means lower short-term rates for longer (see chart) and therefore lower home equity and adjustable rate mortgage monthly payments. It also means lower longer-term rates and cheaper fixed rate mortgages (see chart). We may even see some new refi activity. Other benefits include cheaper transport (potentially lower travel costs) and shipping costs (lower UPS/Fedex surcharges), as well as cheaper PVC, nylon, polyester, foam, etc. - all of which should benefit the consumer. The US has become a major energy producer, with the sector partially responsible for improving economic growth and lower unemployment in recent years. 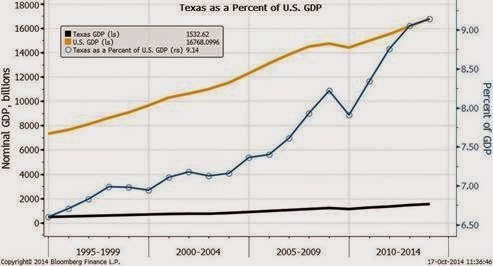 As an example here is the GDP of Texas as a percentage of the US GDP. This trend is driven in part by the recent energy boom in the state. If oil prices remain under pressure, this boom could soon be in jeopardy. While large US energy companies are sitting on a great deal of cash, at some point they will begin to cut portions of the higher cost development and production. And private investment into energy and oil services firms, which has been brisk lately, is likely to moderate. For example, here is the private debt and equity capital flowing into various states last month. While, only a portion of the funds going to Texas is directly energy related, various other Texas firms funded by PE (including some real estate, manufacturing and financial companies) have been benefiting from the energy boom. Soon that flow of private capital may slow dramatically. To put this into perspective, here are the jobs directly generated from Texas oil and gas extraction in recent years. And this does not include the thousands of jobs that support this industry. Such trend is unlikely to continue if oil prices remain at current levels or fall further. In fact, while the overall industrial production growth in the US has been strong recently (see chart), a big portion of the gains are energy driven (see chart from Lee Adler). A slowdown in that sector will be quite visible across the US. A significant number of middle market energy firms in the US - many funded via private capital (above) - are highly leveraged. The leveraged finance markets are becoming quite concerned about the situation - even for larger firms with traded debt. Here is the yield spread between the energy sector loans in the Credit Suisse Leveraged Loan Index and the index as a whole. Rumors have been circulating of a number of energy (and related services) firms getting ready to "restructure". There are also stories that some large funds are gearing up to scoop up distressed debt of levered energy firms. However, in spite of the ample liquidity out there, bets on companies with significant commodity exposure will be limited going forward - at least until stability returns to the oil markets. Defaults, layoffs, and cancelled projects in the energy space may be in store in the near-term. And that is sure to have a negative impact on the US labor markets and the economy as a whole. Finally, this is terrible news for the development of alternative energy sources. At these prices, fossil fuels are becoming increasingly difficult to compete with.